Brothers Max and Jackson were born a year apart from each other, and parents Lara and Steve were in love at first sight. Both boys were sweet babies, and well-tempered. As they developed, the boys’ parents started noticing some delays. Soon after, Max and Jackson were both diagnosed with autism, but what at first was a big unknown has turned into a life full of blessings. Max is 8, he loves to learn new things, especially geography. 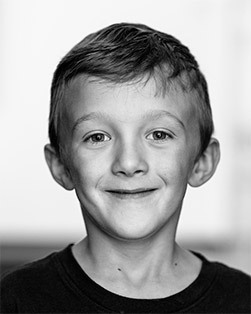 He loves to perform daring stunts, and is really into games right now, including Jenga, Trouble, Circuit Makers, Operation, Pie Face, and Chutes and Ladders. Max has an incredible memory. This past month he memorized part of the Declaration of Independence for school. Max also loves roller coasters. He can tell you anything about almost any roller coaster in the world. He knows which one goes the fastest and is the longest. 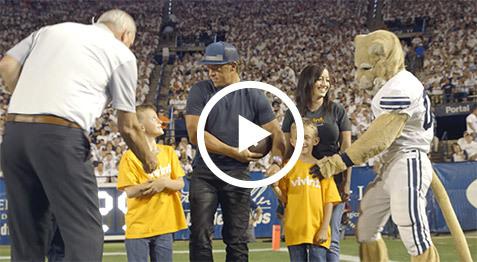 In October of 2014 Vivint Gives Back surprised Max with his very own roller coaster. Adding the roller coaster to their house gives Max a way to get some of his wiggles out in a fun way so that when it comes time to focus on school work he is able to. Max has an incredible amount of empathy, compassion, and thoughtfulness in his soul. He is very loving and kind, and worried about everyone. Max has a strong body and a gentle spirit. His enthusiasm for life is contagious and inspires others to be their best. Jackson is 7, he loves anything to do with science. He is very into learning about the earth, weather patterns, and animals. He loves to tell jokes and make people laugh. He loves Minecraft. He also loves playing with Lego builders. When Jackson was younger he struggled with the strength in his arms. He had a hard time using a pencil to color. 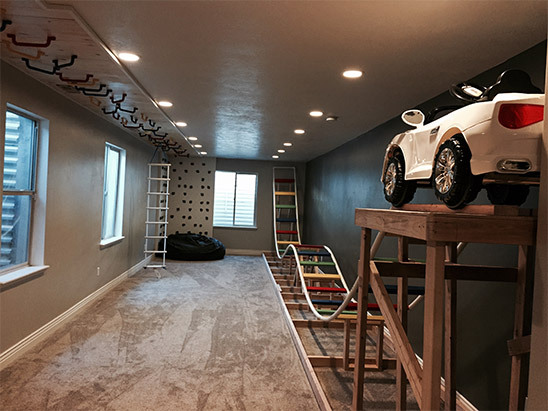 Vivint Gives Back installed monkey bars and a climbing wall in their home to help Jackson gain strength and dexterity in his hands. Now, after using the monkey bars and climbing wall, Jackson is able to grasp a pencil and write, something he was not able to do before. Jackson has a girlfriend Mia who is his best friend. He eats lunch with her every day, and writes her cute notes and talks about her often. Jackson is very intelligent, observant, and has a very good memory. Jackson is a great help to Max, and is very aware that he needs reassurance and extra help sometimes. The Pratts love their Vivint Smart Home system. 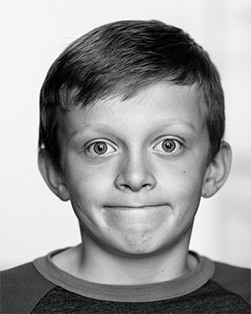 Before they had the help of a Vivint Smart home system, Max used to be a runner and would disappear for long periods of time—terrifying for his parents. Having the Vivint Smart Home has been such a huge relief to his parents, who are now alerted any time a door or window is opened. Even as Max has aged and running away is less of an issue, his parents know he is very trusting and would open the front door and invite anyone one in that knocks! The Vivint Smart Home lock and doorbell camera has made it possible for them to "screen visitors" before they let Max welcome in visitors. He also loves to check the weather and the time on the touchscreen panel, he does this several times a day. Having the ability to watch him on the cameras in the basement gives him alone time to spin and jump and climb, while his parents can watch to be sure he is safe. On the other hand, Jackson is a worrier, and is always concerned about danger and getting hurt. With the Vivint Smart Home system he sleeps so much better at night—they all sleep better at night. 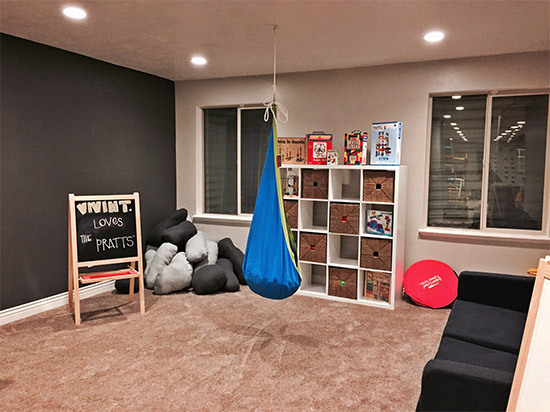 Vivint Gives Back installed a sensory room for the boys in their home, and their parents have noticed that the boys’ anxiety and worry have been greatly reduced. They are able to escape into their own world that helps meet all of their sensory needs in this amazing room. The boys’ social skills improve while interacting and playing with family and friends in the sensory room. Their parents feel it has been such a joy to watch their improvement. To learn more about how Vivint Gives Back helps families, visit vivint.com/company/gives-back.